Due to the injury to my calf on Saturday, I had to nix some runs. First, I only completed half of my planned 15 miles on Saturday for 7.5 miles. Sunday’s run was supposed to have been 5 miles, Monday was supposed to be 9 miles and Tuesday was supposed to have been another 5. I completely nixed Sunday’s and Monday’s runs and only ran 4 on Tuesday. Sure I’m disappointed that I had to cut 22.5 miles from my training schedule, but I’m not going to be upset about it or dwell on it. It’d be the running equivalent of crying over spilt milk. It would do me no good. I just have to accept that it happened and continue on. Which is what I’m doing. In fact, I redid my marathon training schedule to reflect the runs that I didn’t do and the different mileage. You see, because I didn’t complete my 15 mile long run on Saturday, that set me back a little bit with my weekly long run progression. So I had to make those adjustments as well. No big deal really. 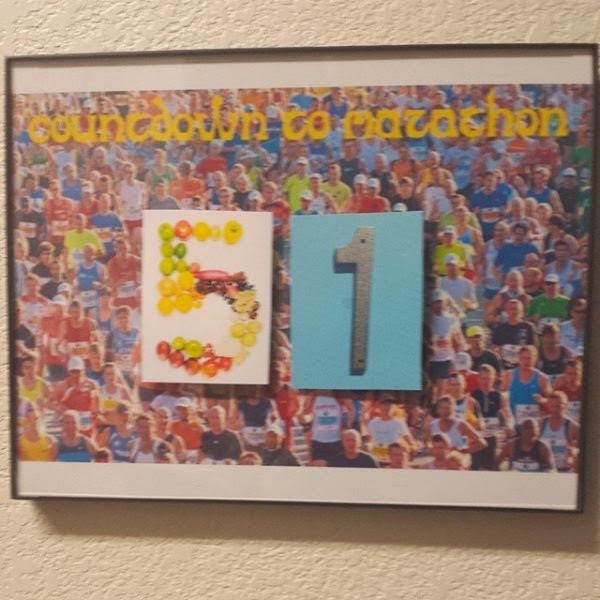 So, instead of running 551.something miles during my 16 weeks of training, I’ll be running more like 523.15. I’m cool with that. Totally cool. I wore a compression sleeve on my right calf from Saturday evening until Wednesday and I really believe that has helped. I haven’t taken any of the prescribed pain meds since Saturday. I mean, sure the doctor didn’t prescribe me anything major, just 600mg ibuprofen and some tramadol (I have no clue of the mg). Also, I’ve only taken the ibuprofen…haven’t taken any of the tramadol. The pain just hasn’t been that bad. When I went for my 4 mile run Tuesday morning, my calf felt “tight” the entire time. I’m sure I was limping just a little bit, especially toward the end of the run. I made good time. All my miles were between 11:10 and 11:30, so that’s good. I made sure to focus on how my calf was feeling the entire run, which made the run “seem” a little longer than it was and “seem” like I was going slower than I was as well. But, I wanted to make sure that the pain didn’t get worse. I did find myself wishing that I could remember how it felt right before the “pop” happened on Saturday. I know that it got super tight and then it happened. Mostly, with the 4 miles I ran, I wanted to see how my calf would feel and, really, it felt mostly good, just tight. And I think that tightness was due to the fact that I have been avoiding moving it since Saturday. Thursday, I ran 8 miles. I’m hoping to be able to still do my half marathon Saturday. The Halloween Half. Really, though, I’ll do it anyway, even if I’m walking a majority of the race. I’m one of those “dumb” runners that if I paid for my race entry, then dammit, I’m doing the race! Unless it’s a 5K or something else that doesn’t give bling, then I might skip it if I’m injured. But, my 8 miles went well on Thursday, just a sore muscle (the one I strained) for a few hours post-run, so I see no reason why I can’t do well on Saturday. I have decided that I will run it at marathon goal pace, which is 12:30 min/mi. That’s a good, conservative pace and I won’t be overexerting myself. Also, it will be good to practice my marathon goal pace in a race setting for an extended distance. It will help me know what to expect on how to start out with pacing myself in the actual marathon. I’m just going to set my Garmin to show me my current pace for the entire race. Something else I thought of in regards to the marathon…maybe I should invest in some really good, high quality, full-length (hip to ankle) compression running tights to wear when I run the marathon. They would help decrease muscle soreness and speed up recovery time a little bit. They would also come in handy on my longer long runs that I’ll be doing later next month. Before those longer long runs, I’ll need to stock up on some ice (I’ll just mass-produce and then bag it from my fridge’s ice maker) so I can do ice baths after those longer long runs. Also, as of yesterday's run, i'm at 93.1 miles for the month of October. Sure, it pains me a little to think that if it weren't for my strained calf muscle I would be at 115.6 already, but whatever...spilled milk, right? 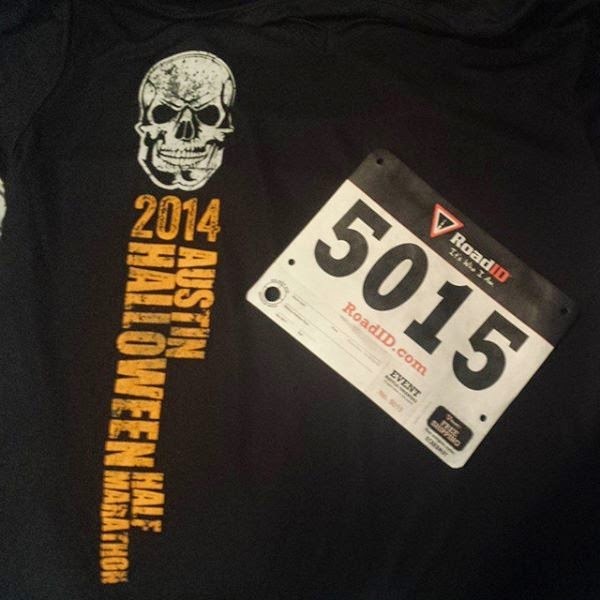 I picked up my packet for tomorrow's Halloween Half Marathon. Loooooooooove the shirt...however, extremely disappointed in the bib. Half marathons should always have bibs that are customized to the event. I haven't posted the countdown on here in a while, but, here it is...51 days and counting down!